It’s hardly a secret that the Japanese recruitment market is one of the toughest in the world. In Tokyo right now there are two job openings for every candidate, and cultural differences in thinking about work and career decisions can create a disconnect between foreign employers and top quality Japanese talent. That said, just because a task is daunting doesn’t mean that it can’t be accomplished. Promoting your employer brand through social media channels remains an important keystone for any online recruitment strategy regardless of location. In fact, in a country where many members of the workforce only work for one or two companies throughout their entire careers, employer branding is arguably even more important. The question is, which channels will give you the best chance of reaching your target audience? Because changing jobs is a less common activity in Japan, it doesn't make much sense to rely on traditional recruitment platforms like Indeed for your sourcing needs. 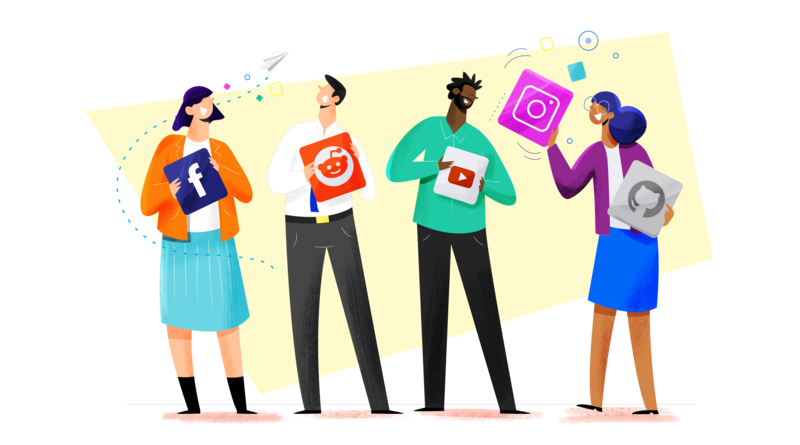 Most job candidates will be passive rather than active (and by a much wider margin than elsewhere), which means that your top recruitment channels will be the region's most popular social media platforms. Thus, your best bet in some ways might be Line. As of 2016, almost 80% of smartphone users in Japan used Line, a homegrown messaging and social media app that might be compared to WhatsApp. Today that number more than 90%, accounting for more than half of the country’s total population. Though it’s virtually unused in the West, it remains Japan’s most popular social channel by far. Though the app, which can only be accessed on a mobile device, does feature status updates and other group-communication features (with emoji-like “stickers”), many users are only interested in the app for its direct messaging functionality. While the preference for direct messaging may make Line appear to be a less-than-ideal platform for maximizing the reach of your employer brand, many marketers are getting creative about using the app to improve their brand awareness. Some, for instance, have had success with Line Points Ads (in which users watch a video advertisement or perform some other task in exchange for points that can be spent in-app). Others still see the potential for the app as a lead nurturing tool, based on the fact that users can “friend” companies and opt into receiving direct messages from them. Fun fact: LinkedIn, despite being one of the most successful social networking sites in the U.S., has fewer than 1 million users in Japan. Some have suggested that a strong culture of privacy has deterred many Japanese users from signing up for a service that requires giving over (and publicizing) large amounts of personal information. While the presence of Facebook at number 4 on this list belies that interpretation a little, it’s certainly true that social media sites that can be used anonymously have especially high rates of use in Japan. Case in point, YouTube is the second most popular channel among mobile phone users. The anonymity of platforms like YouTube (and Twitter, which comes in at number 3 on this list) do present challenges for recruiters, both in terms of targeting and in terms of vetting your applicants (since particular applications can’t necessarily be traced to specific profiles). That said, the shear number of users on these platforms make them valuable tools for brand promotion, even if you might not be able to track your sourcing as closely as would be ideal. Twitter and Facebook are in a virtual tie for third place. As of 2016, Facebook had captured 41% of mobile device users in Japan but only about 20% of the population overall. Twitter, by contrast, had boasted about 30% of both the country as a whole and mobile users in particular in 2016—but its numbers are on the rise, with a countrywide user base of more than 35% as of 2017 and more users being added every day. Because of this recent, ongoing surge in growth, we’re making a judgement call and giving it third place on our list of channels. Like YouTube, the platform’s surging popularity might have something to do with the relative anonymity it offers, meaning that broadly disseminating your brand message and communicating your EVP will be easier than nurturing leads. While you won’t be able to target your employee personas in as granular a manner as you would on say, LinkedIn, you can certainly aim for users based on their interest—though, again, there will be an element of guesswork in terms of measuring the effectiveness of your efforts. Compared to North America and Europe, Facebook’s popularity in Japan is less than impressive. But that just tells us how high the bar is for Facebook’s successes. Though the Japanese market hasn’t embraced Facebook as warmly as others, it still boasts a sizable chunk of the country’s population as members. Interestingly, in Japan it’s mostly the over-30 crowd that uses the world’s premiere social networking site, with employed adults using the platform at a much higher rate than college students. In a way, the site almost functions the way that LinkedIn does in other parts of the world, giving older professionals the chance to curate a public persona that matches the professional image they’re trying to project. As a result of the generally high level of competition for talent, coupled with low user numbers compared to Line and YouTube, cost per click for Japanese Facebook ads tends to be extremely high—but a strong employer brand and a constant stream of targeted messaging can often help to ameliorate problems like these. In contrast with its parent company, Facebook, Instagram boasts a younger demographic, with college-aged women making up a large proportion of the platform’s user base. Though it only clocks in at fifth on this list, it’s experiencing rapid growth and could easily overtake Facebook within the next few years. This shouldn’t be too shocking, considering that Instagram, like Twitter and YouTube, allows for anonymous sign-ups. More than that, the platform is based on visual content, which is likely a selling point for many in a country with a reputation for strong aesthetic appreciation. For recruiters, Instagram poses many of the challenges that Twitter does—but with a twist. It’s a channel designed to reward high-quality visual branding. If you can incorporate memorable visuals into your employer branding efforts, Instagram is one of the social media sites most likely to reward your efforts, nowhere more so than in Japan.